Who owns Northern Ireland's 153,000 legally held guns? AS the Department of Justice consults on proposed changes to firearms licensing laws here, The Detail can reveal information about the owners of Northern Ireland’s 153,459 legally held guns. Almost 60,000 members of the public own over 146,000 firearms with the remaining 7,018 legally held guns belonging to serving police and prison officers. The Detail has been given rare access to information stored on the PSNI’s Shogun firearms database in response to a Freedom of Information request we submitted earlier this year. We have analysed detailed information provided on each of the 59,585 people living in Northern Ireland who currently hold firearms licences. For each individual person, we were given the gun owner’s age, gender, the police district they live in, the number of weapons they own and the conditions of use on their licence. The information relates to the content of the PSNI’s firearms database as of March 1st, 2012. Individual owner details were not provided for weapons held by serving police and prison officers. Although the PSNI did confirm that 5,065 firearms were owned in total by the PSNI and 1,953 guns owned by the Department of Justice (DoJ) have been “loaned” to serving prison officers. It is not clear if this “loan” is in any way connected to the personal details of 1,583 prison officers being “compromised” by an alleged Stormont spy ring exposed in 2002. 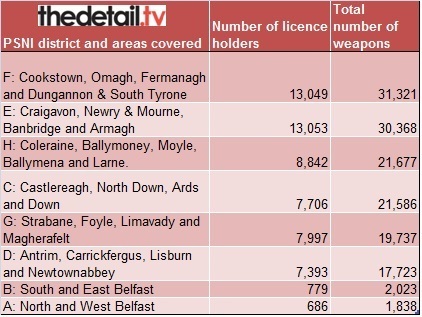 In total, there are 153,459 legally held weapons owned by people living in Northern Ireland. Some of the licence holders with the largest gun holdings have paintball games among their licence conditions. This includes eight people who own between 150 and 175 firearms each. Their police districts are G and F in the west of Northern Ireland. Of the 59,585 licence holders we have detailed information on, 98% are male. The youngest gun owner is 17-years-old and the oldest is 103. A total of 2,924 licenses have ‘Personal Protection Weapon’ among the conditions of use. These holders include ex-PSNI, civilians and prison officers. Day-to-day decisions on firearms licensing in Northern Ireland are administered by the Chief Constable through the PSNI’s Firearms and Explosives Branch. The Department of Justice is responsible for legislation relating to the possession and use of firearms. The DoJ has put forward proposed changes to the current legislation and this includes increasing the cost of applying for a licence and reducing the legal age of gun ownership to 12. The lower age limit is now 16 and it currently costs the PSNI more to run the licensing scheme than they recover in fees. It took almost two months for the PSNI to release information to us from its firearms database as we had to refine our initial Freedom of Information request. We initially asked for a detailed breakdown of the information held on each firearm certificate holder in Northern Ireland including how many guns each individual owns, their gender, age, postcode area, the reason for their certificate being issued and if it had ever been revoked. The PSNI refused to release information on licence holders’ postcode districts claiming it could increase the prospect of identifying individual firearms certificate holders and that this would put them at risk of theft. Instead we agreed that the police district of each firearm owner would be provided to reduce the likelihood of individuals being identified. Following a discussion about the column headings used in the PSNI’s firearms database, it was also agreed that the following information would be released for each gun owner – their age, gender, number of weapons held and licence conditions. 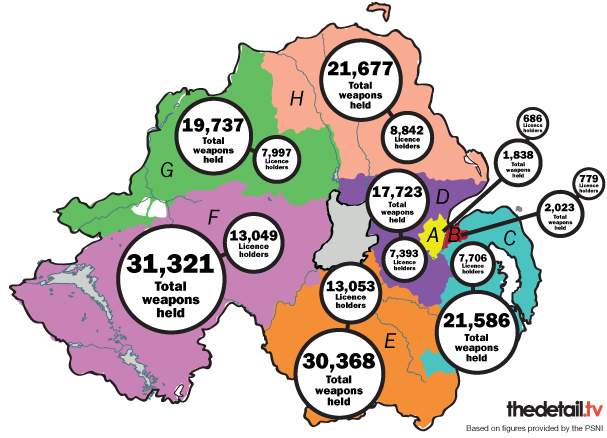 We were given this breakdown for 59,585 gun owners in Northern Ireland and the information relates to the content of the PSNI’s firearms database as of March 1st, 2012. The information released to The Detail shows that more than 60,000 people have been granted a firearms licence in Northern Ireland. In total, there are 153,459 legally held weapons and we were provided with detailed information on 59,585 licence holders. 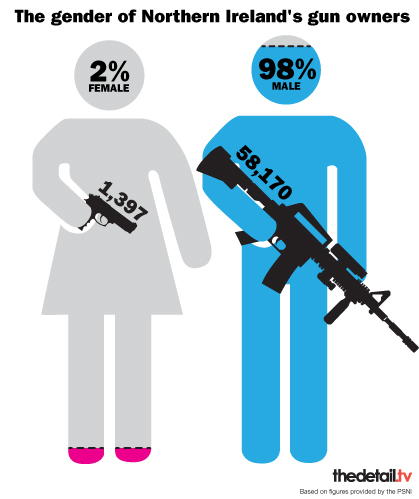 The average number of weapons owned by each licence holder is 2.5. Some of the largest gun holdings are connected to paintball use but others with different licence conditions also hold a large number of guns. One 51-year-old male owns 109 firearms – including an ex-PSNI Personal Protection Weapon. 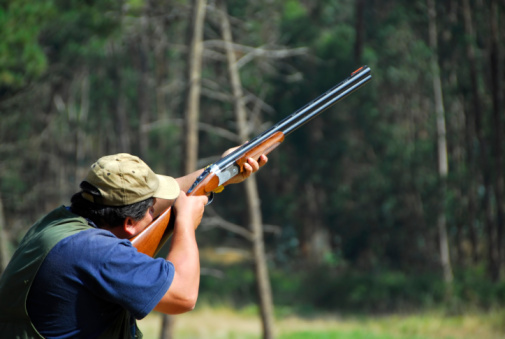 The conditions for his use include target shooting, sound moderator, collector and sporting purposes. He lives in police district C, which covers the Castlereagh, North Down, Ards and Down areas. The PSNI’s response to our request also stated that some other large holdings relate to museums, target clubs and authorised collectors. Of the 59,585 licence holders we have detailed information on, 58,170 are male, 1,397 are female and the gender was not given for 18. 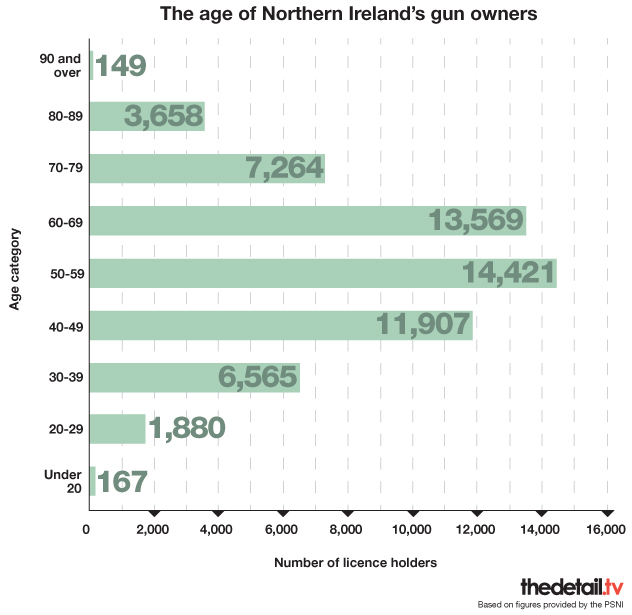 The average age of Northern Ireland’s gun owners is 53. The youngest is 17 and the oldest 103. A total of 149 teenagers in Northern Ireland hold a firearms licence (as of March 1st 2012) and together they own a total of 347 guns. Of this group, 142 are male, 18 are 17-years-old, 33 are 18-years-old and 98 are 19-years-old. The largest number of guns owned by a teenager belong to a 19-year-old living in District F who has 26 weapons. The conditions on his licence include target shooting and sporting purposes/vermin control. He is followed by a 17-year-old male who owns 11 guns and a 19-year-old male with a hold of 10 guns. At the other end of the age scale, 167 of the gun owners are aged 90 or older. Only three of them are female and this includes a 99-year-old female in C District with two guns. The oldest male is 103-years-old and he has one shotgun for sporting purposes/vermin control. This is in D District. One firearm certificate is issued to an individual to licence all approved firearms and ammunition in their possession. It is an offence for any person to purchase, acquire or have in their possession, a firearm or ammunition without holding a valid firearm certificate. The term ‘firearm’ is defined as a lethal barrelled weapon of any description from which any shot, bullet or other missile can be discharged. It is possible for a young person between the ages of 16 and 18 to apply for a firearm certificate, but only under certain specific conditions. A youth permit can be granted for a young person for an airgun, shotgun or .22 rifle, only if the firearm is to be used for pest control or the protection of livestock on agricultural land occupied by the young person or on which he works and also resides. The Chief Constable can also grant a firearms certificate to a young person for an airgun or shotgun for sporting purposes, provided he is under the direct supervision of a person who has attained the age of 21 years and has held a firearm for that type of firearm for at least three years. The PSNI’s Shogun system records details of firearms certificates. The information recorded includes name, address, date of birth, certificate number, conditions of licence, serial numbers and data on people whose application for a certificate was refused or their certificate revoked. The system also holds information on registered gun dealers. 1. Is not prohibited by law from possessing a firearm, is not of intemperate habits or unsound mind and is not, for any reason, unfit to be entrusted with a firearm. 2. 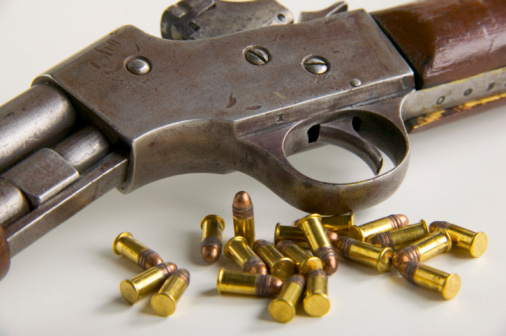 Has good reason for purchasing, acquiring or having in their possession the firearm or ammunition. 3. Can be permitted to have that firearm or ammunition in their possession without danger to public safety or to the peace. The PSNI website lists responses to other Freedom of Information requests related to firearms ownership in Northern Ireland. The documents do not name the requesters. Many requests for information have been turned down on cost grounds. However, one recent PSNI response confirms that a total of 646 applications for firearms licenses were rejected in the years 2008, 2009 and 2010. The same response – dated July of this year – also states that there are 59 authorised target clubs in Northern Ireland which are authorised to use 69 firearms ranges in Northern Ireland. The issue of legally-held firearms recently hit the media headlines after Northern Ireland’s Health Minister Edwin Poots fired two shots into the air from his legally held shotgun to warn off intruders at his home. The PSNI said it was investigating the incident after Mr Poots fired from an upstairs bedroom at his house near Lisburn in Co Antrim in June. Each firearm certificate holder has conditions listed on their licence. The data we were given shows that the most common condition codes featured on Northern Ireland’s firearms licences are ‘sporting purposes/vermin control – shotgun’ (52,503 licences) and ‘sporting/vermin-air/RFrifle/below .236’ [sic] (29,180 licences). The PSNI confirmed that this second condition means the use of a firearm which must be below .236 calibre is restricted to sporting purposes and vermin control only. A total of 2,924 licences have ‘Personal Protection Weapon’ among the conditions of use. These holders include ex-PSNI, civilians and prison officers. A total of 2,775 of Northern Ireland’s firearms licences include target shooting in their conditions and 139 licences include the condition ‘deer culling outside of Northern Ireland’. Other condition codes used include ‘big game use outside the UK’ (15 licences), re-enactment and theatrical use (51 in total), collectors (54), weapons on display in Orange Halls (1 licence), shark shooting (1), underwater research (1), humane killing of sick and injured animals (14) and protection of employment (8). All of the PSNI’s condition codes are listed in a document provided below this article. Some of the condition codes are preceded by the text ‘do not use’. These relate to obsolete codes which have been replaced by others on the list but are being amended in a phased approach as and when applications are processed. In the meantime, they are still recorded against some records. The PSNI withheld information on two of the condition codes – Code 48 and Code 85. The PSNI’s Freedom of Information response letter stated that disclosing this information would “breach the data protection rights of a third party”. It also said that the public interest in maintaining this exemption outweighs the public interest in disclosing the information. The full firearms data released by the PSNI is available in Excel format below this article. The figures in row 30 relate to the PSNI and row 31 to the DoJ firearms loaned to serving prison officers. Some records have been allocated to ‘X District’ which does not exist as a policing district. These records did not have a local police station assigned to them on the PSNI’s database. The PSNI’s Freedom of Information team also released a summary table giving the total number of weapons held in each police district and a description of the condition codes. Rows 137 – 203 on the condition code pages relate to codes migrated from the previous database to Shogun which should have been removed from the system. The PSNI said that in the majority of cases they should relate to cancelled, refused or revoked certificates. Since the devolution of justice to Northern Ireland in 2010, the DoJ is responsible for legislation relating to the possession and use of firearms other than for personal protection weapons and some appeals and prohibited weapons cases where there is a national security element. In June of this year, Justice Minister David Ford published his firearms licensing consultation. Key proposals include varying the firearms licensing fees and reducing the age at which young people can use shotguns and airguns to 12-years-old under certain conditions. This includes that the young person must be supervised at all times by a person who is at least 21 and who holds and has held a firearm certificate for the type of firearm in question for at least 3 years. The department’s consultation document states that the Chief Constable regards a reduction to the age of 12 as suitable. The PSNI is responsible for managing the firearms licensing regime in Northern Ireland and currently it costs more to run the scheme than they recover in fees. Under the new proposals, the cost of granting a firearms certificate would increase from £50 to £120. A firearms dealer’s certificate would increase from £150 to £697. Speaking as he launched the consultation, Minister Ford said: “It is estimated that based on the current licensing fees, the PSNI only recover on average 36% of the costs of administering the regime. I consider this to be unsustainable. “While I understand that no-one would welcome an increase in fees, the proposals represent a realistic cost for the administration of such an important service. The proposed new fees take account of the cost of firearms enquiry officers’ home visits on applicants, inspections of land and storage cabinets, making local enquiries and providing a report to the PSNI’s Firearms and Explosives Branch as part of the application process. The branch currently administers an average of over 20,600 firearms-related applications every year – including change of address or varying certificates. On average there are 256 refusals per year – around 1.2% of applications received. Other proposals the Minister is seeking views on include enabling a firearms dealer to substitute one firearm for another within specific bands and provisions concerning non-Northern Ireland residents visiting the province with firearms for sporting purposes. This would remove the need for the Chief Constable to issue certificates of approval for holders of firearms certificates or shotgun certificates in Great Britain to travel to Northern Ireland with their firearms. The consultation runs until September 20 and the consultation document can be downloaded from the DOJNI website here. We asked the Department of Justice for a comment on the response so far to the licensing consultation. A DoJ spokeswoman said: “The issue of firearms licensing is a matter for the Chief Constable, who is accountable to the Northern Ireland Policing Board. And a PSNI spokeswoman said: “The PSNI is a consultee in the current consultation process and will provide comment directly to the Department of Justice under those arrangements."